The first series in our generation to combine fantasy with spiritual reality. 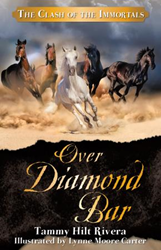 In the new novel of Tammy Hilt Rivera’s The Diamond Bar Episodes series, Over Diamond Bar: The Clash of the Immortals, ($15.99, paperback, 9781545600429; $8.99, e-book, 9781545600436) readers meet back up with protagonists Crystal, Silver and Joshua River—siblings who uncover a portal to a parallel realm where the supernatural intersects with their idyllic hometown. In order to rescue captive family members, the River kids must ward off enemies from the unseen realm. Tammy Hilt Rivera has been using her creative gifts in the parallel worlds of business and ministry for decades. Whether raising her three children or serving as former Director of Intercession and Children's Ministry for Father's House Ministries of Los Angeles, Rivera’s passion is to share the Word of God and spiritual truth in creative ways. Rivera is also the author of Under Diamond Bar: Journey into the Invisible, which is the first book of the Diamond Bar Episodes series. Xulon Press, a division of Salem Media Group, is the world’s largest Christian self-publisher, with more than 12,000 titles published to date. Retailers may order Over Diamond Bar: The Clash of the Immortals through Ingram Book Company and/or Spring Arbor Book Distributors. The book is available online through xulonpress.com/bookstore, amazon.com, and barnesandnoble.com.